If you want to catch a ride TransLink’s bus stop #61452, you have to either stand on the busy highway or climb over the concrete barrier at the edge of the road. If you want to catch a ride at TransLink's bus stop #61452, you have to either stand on the busy highway or climb over the concrete barrier at the edge of the road. The stop — on the Loughheed Highway in Pitt Meadows, B.C., about 40 kilometres outside Vancouver — has been voted one of the worst in all of North America by Streetsblog USA's annual Sorry Bus Stops contest. "Vancouver probably isn't the first place that springs to mind when you think about sorry bus stops. But this stop ... is a doozy," writes Angie Schmitt. The contest takes submissions for readers on the "sorriest, most dangerous and neglected bus stops" on the continent, narrows the list down to 16, then pits them against each other in a March Madness-style voter bracket. It's currently in the top 4, having recently beat out a bus stop adjacent to an eight-lane freeway in San Rafael, Calif. The B.C. 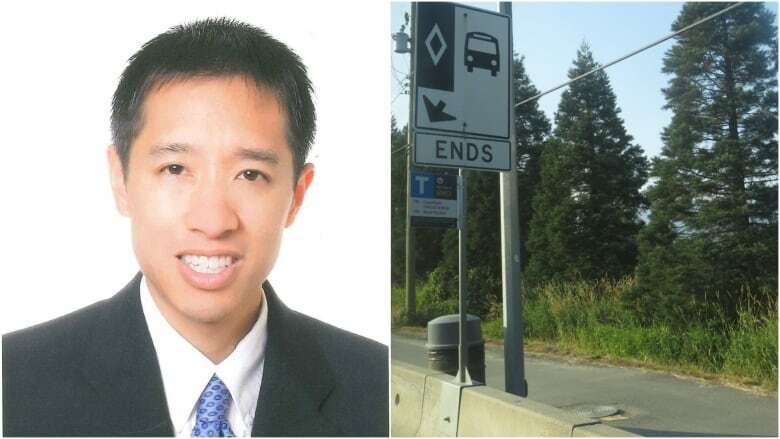 stop was submitted by San Francisco's Jason Lee, who came upon it while he was in B.C. for an annual public transit conference. He said the only opening through the jersey barrier along the side of the highway is about 50 metres away from the bus stop itself, making the stop both dangerous and inaccessible. "If people aren't waiting at the stop, they might not have time to actually run and catch the bus and there's a potential for the driver to not see the person waiting and just ride right through without stopping," he told As It Happens guest host Helen Mann. "If someone uses a wheelchair, they really have to use the side that's exposed to the highway and there isn't a lot of room for error there." The highway itself is notorious, with 33 fatal crashes between 2004 and 2013, according to a CTV round-up of B.C. 's deadliest highways. And while there is a bus-only lane in front of the stop, Lee said see saw plenty of cars streaming through it. "I think that's part of the problem. As those private vehicles are speeding along, there's potential for them to have a collision with people waiting at that stop," he said. TransLink said it doesn't own the land on which #61452 operates. Rather, it belongs to B.C. 's Ministry of Transportation. "We are aware of the access concerns with this stop and are working with the Ministry to address them," TransLink spokesperson Chris Bryan said in an e-mail. The ministry, hower, said the decision to designate this location as a bus stop was made by TransLink and the Coast Mountain Bus Company. "It's concerning to hear that people using this bus stop don't feel safe, and appreciate that this photo has been brought to our attention," the ministry said in an emailed statement. "We are in the process of setting up meetings with TransLink and the Coast Mountain Bus company to see what we can do to make the bus stop more adequate." The ministry said they will look at either redesigning the bus stop or moving it to an alternative location that's "still convenient for transit users." Despite his criticisms about this particular bus stop, Lee said he was impressed overall with TransLink's operations. "I think British Columbians should actually be quite proud of the transit system that operates in the Lower Mainland," he said. "TransLink has really emphasized mobility not just in the Vancouver core, but in the suburbs surrounding there. So I think they should be really proud. I think, in this particular case though, it does appear to be the exception to the rule." Written by Sheena Goodyear. Interview with Jason Lee produced by Ashley Mak. Correction: An earlier version of this story stated that Jason Lee was from San Diego. In fact, he is from San Francisco.